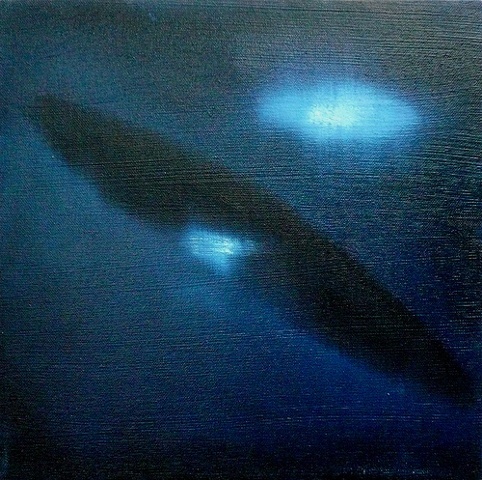 This small painting is part of a series that uses paranormal photography as source imagery to investigate how we apprehend and investigate the unknowable. The 'photograph as proof' is brought into question, while the artful constructs and interpretive aspects of science photography (and pseudo-science) are engaged through reinterpretations in paint. Joy Garnett is an artist based in New York. She studied painting at L'Ecole Nationale Superieure des Beaux-Arts in Paris and received her MFA from The City College of New York. Her paintings, culled from science imagery, news photographs and military documents she gathers from the Internet, examine the apocalyptic-sublime at the intersections of media, politics and culture. Notable past exhibitions include "That Was Then...This Is Now" at P.S.1 Contemporary Art Center, NY (2008); "Image War" at the Whitney Museum of American Art (2006); and "Without Fear or Reproach" at the Witte Zaal, Ghent, Belgium (2003). Garnett is a 2004 recipient of a grant from Anonymous Was a Woman, and is the Arts Editor at Cultural Politics, a scholarly journal focusing on media, politics and culture published by Berg. She is represented by Winkleman Gallery, New York City.